Bobcat Australia announce the availability of the new Selectable Joystick Control (SJC). Buyers can now choose between either "ISO" or conventional skid-steer "H" control patterns with the selectable joystick control (SJC) option from Bobcat Australia. The Bobcat SJC option enables operators to pick their preferred driving style, which makes the loaders more user-friendly. Bobcat Australia say they expect it to be popular among hire companies and contractors who regularly rotate the machine among operators. Bobcat is the only manufacturer that offers SJC. 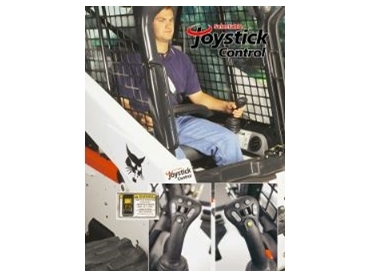 When the Bobcat SJC switch is in the ISO position, the left joystick operates the drive function, and the right joystick controls the lift and tilt function. In the H pattern, the left joystick controls the left wheels and lift arm functions, while the right joystick controls the right wheels and the attachment tilt function. The option can be extremely beneficial in multi-operator fleets because operators will be more comfortable using their preferred control pattern. It also features horsepower management to maximise pushing and digging power and hand engine speed controls with an accelerator foot pedal. The adjustable inching control is excellent for operating attachments like planers, wheel saws, and trenchers because it permits slower travel speeds with full joystick movement while maintaining full hydraulic power for operating the attachment. Not only does this feature create less strain on operators, but it also ensures more consistent attachment performance.